When she was 11, Jaycee Dugard was kidnapped as she was waiting at a bus stop near her California home. For 18 years, she was held in a secret backyard compound behind the home of Phillip Garrido and his wife, Nancy, who both later pleaded guilty to kidnapping and sexual assault. 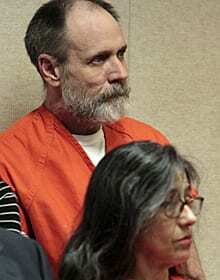 He was sentenced to 431 years to life in prison; she was sentenced to 36 years to life. During her captivity, Dugard gave birth to two daughters. In a 2011 interview, she talked through tears about both the pain and determination she felt as she gave birth to her captor’s child in his backyard while she was still just a girl herself. She was clear and composed throughout the interview with Diane Sawyer of ABC News but became emotional when she talked about her first glimpse of the first of two girls fathered by Garrido. 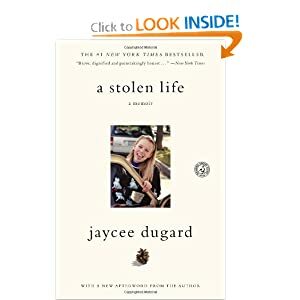 Dugard’s A Stolen Life: A Memoir was published in July. In the summer of June of 1991, I was a normal kid. I did normal things. I had friends and a mother that loved me. I was just like you. Until the day my life was stolen. For eighteen years I was a prisoner. I was an object for someone to use and abuse. For eighteen years I was not allowed to speak my own name. I became a mother and was forced to be a sister. For eighteen years I survived an impossible situation. On August 26, 2009, I took my name back. My name is Jaycee Lee Dugard. I don’t think of myself as a victim, I simply survived an intolerable situation. A Stolen Life is my story—in my own words, in my own way, exactly as I remember it.